Sholten Singer/The Herald-Dispatch Parkersburg South players celebrate a win over Spring Valley in the boys Class AAA, Region IV basketball co-final on Tuesday, March 5, 2019, at Spring Valley High School in Huntington. HUNTINGTON — Spring Valley appeared to have all of the advantages for its boys Class AAA, Region IV high school boys basketball co-final Tuesday. 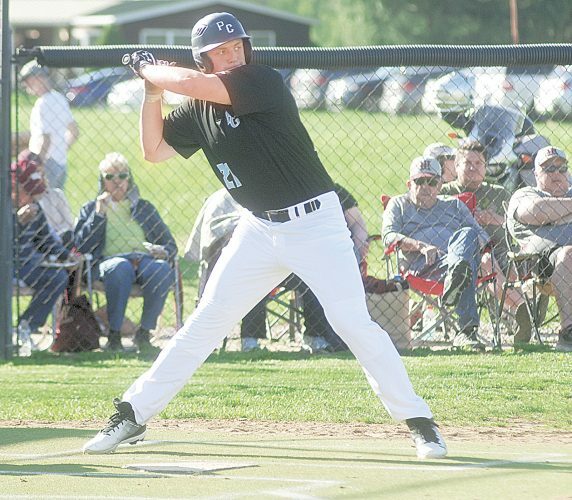 A top-seed in Region IV earned the Timberwolves home court advantage hosting Parkersburg South with a berth in the state tournament at the Charleston Coliseum and Convention Center on the line. The Patriots, however, threw a monkey wrench into Spring Valley’s hopes to earn its first spot in the state tournament since 2003 and pulled a 53-50 upset. 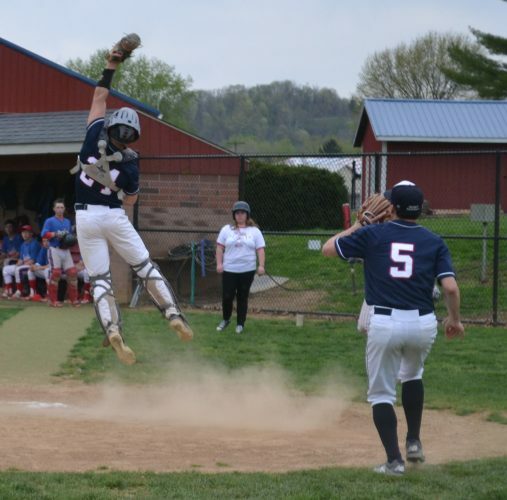 Parkersburg South made its shots early, built a big lead and withstood a furious rally by the Timberwolves to capture one of the region’s two spots in the state tournament where it will meet to-seeded Martinsburg at 7:15 p.m. March 13. Cabell Midland secured the other state tournament berth by winning 42-40 at Parkersburg on Tuesday. Jake Dennis led the South effort with eight of his 10 points in the first quarter as the Patriots built a 16-7 lead by the end of the first period. Seth Fallon took over in the second period with seven of his 16 points to open a 27-7 lead. Malashevich looked to ease his team’s offense’s woes. The senior guard scored seven unanswered points to cut the deficit to 27-14. Junior C.J. Meredith made his first 3-pointer of the game to pull the Timberwolves within 10. Senior Doug Nester grabbed an offensive rebound and got the putback with 49 seconds left in the first half to cut the Parkersburg South lead to 28-19. Spring Valley (14-11) seized momentum to start the third period but found a new obstacle in its way — South’s 6-foot-3 junior forward Malaki Sylvia, who scored three points in the first half but nine in the third quarter. Still, Spring Valley managed to tie the game at 34-34 on a triple by Meredith only to watch Sylvia score the final five points of the period to give the Patriots the lead back at 39-34 heading into the fourth. Sylvia grabbed an offensive rebound and the putback for the first points of the final quarter to build a 41-34 lead. 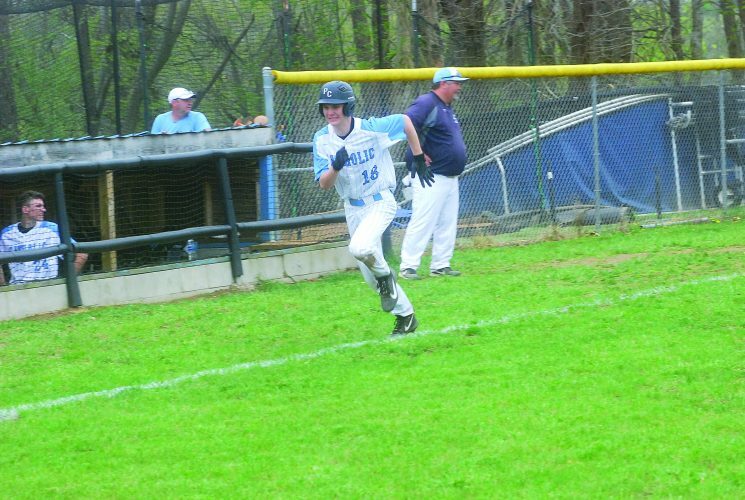 Spring Valley battled through the rest of the game attempting to play catch-up. Meredith cut the deficit to two points with three foul shots when he was hit on the arm while attempting a 3-point shot. The Patriots made no better than 50 percent from the foul line each time the Timberwolves fouled. Spring Valley’s rally attempt stalled with 16 seconds to go when a pass to Chase Maynard sailed out of bounds with the ‘Wolves trailing 50-47. Fallon made only one of the two free throws at the other end to keep Spring Valley in the game. Meredith gave the fans still more hope by making another 3-point shot, his sixth of the game, to make it a 51-50 game with 7.9 seconds remaining. Fallon came through with two free throws after the Timberwolves fouled on the inbounds, leaving Spring Valley with one final play and just 7.0 seconds to get a game-tying three point shot. 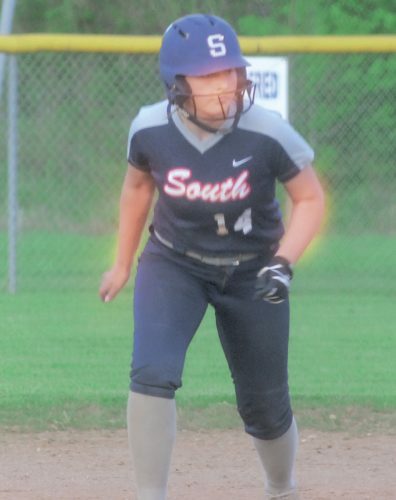 It never came as Parkersburg South turned up the defensive pressure and the Timberwolves never got the look it needed. 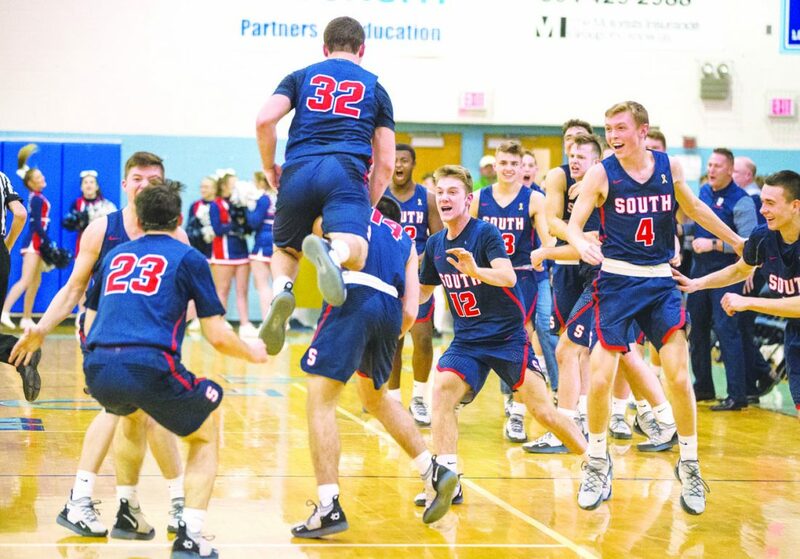 Parkersburg South improved to 8-16 on the year and avenged an 82-72 loss to Spring Valley on Dec. 27 in Parkersburg. 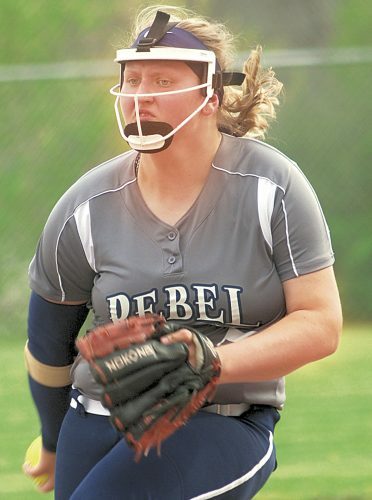 The Patriots, making their seventh straight state tournament appearance, had lost 4 of 5 games coming into the contest but were never fazed.